Enraged members of a rural community neighbouring the Hluhluwe-Imfolozi Park are up in arms, defending their land and saying they do not want a proposed coal mine. The stand-off is not only between community members and Ibutho Coal, which intends to mine on the land, as locals have also accused their traditional leaders of selling land to the company. A senior official of Ibutho Coal, who is not authorised to speak to the media, told The Mercury on Tuesday that the Fuleni mine would go ahead despite the objections. The homes of 16 000 families would have to be demolished. A member of the Mthethwa Traditional Council, Mbhekeni Mthethwa, said the council had supported the mining after being convinced that it would bring development to the community. He said the mine would have a lifespan of about 40 years. He also said it was “inevitable” that homesteads, two schools and a clinic would be demolished to allow for the mine to be built. Mthethwa said it was wrong of the community to involve lawyers in the matter that should be discussed within the jurisdiction of the tribal authority. The community said it had been told that the company would give each family a cow and a goat to slaughter to apologise to ancestors for removing graves. Late last week the community of Ocelwane, under the Mthethwa Tribal Authority, barricaded their dirt road with burning tyres and rocks to prevent officials of the government’s Regional Mining Development Environment Committee from inspecting the land. 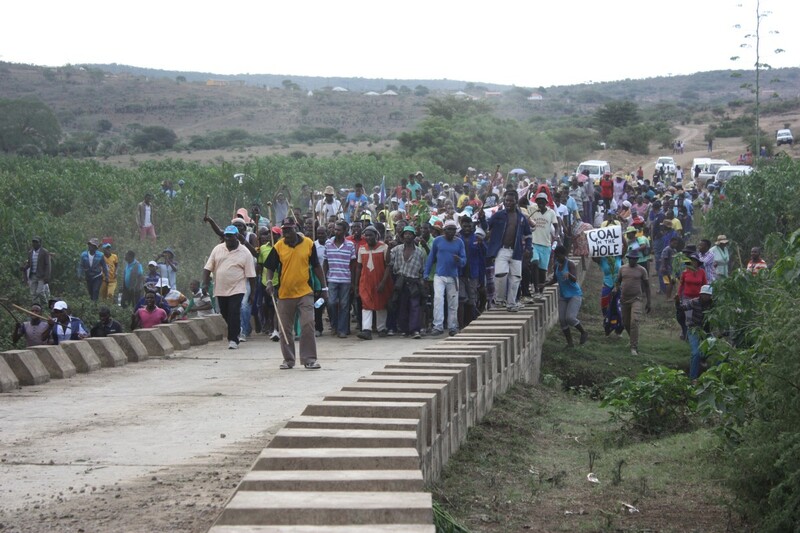 The community established the Umfolozi Community Environment Justice Organisation two years ago to fight the mining. The organisation’s secretary, Phila Ndimande, said villages to be affected were Ocelwane, Ntuthunga, Novunula, Emakhwezini, Fuleni and Shayamoya. It is also feared that air and noise pollution would affect the neighbouring Hluhluwe-Imfolozi Park, Africa’s oldest game reserve. Ndimande said accepting mining because of promises of employment opportunity and development would be like “accepting poisoned food”. Mthethwa said the negotiations started in 2006 and agreements between the Mthethwa Traditional Council and Ibutho Coal were reached three years later. “But the progress has been stalled by threats made by members of the community, especially those of Ocelwane,” he said. Ndimande said the community was angry that despite its repeated rejection of the mining, Ibutho Coal officials kept coming to the area. “They have brought in heavy duty machines without our approval. They have left holes on the ground that are dangerous to our cattle,” he said. Across the Mfolozi River, in the Mkhwanazi Tribal Authority, is the 10-year-old Somkhele Coal Mine. The Ocelwane community cited living close to this mine as the reason they were vigorously opposing to mining on their land. They said Somkhele Mine polluted their air. Every time there was rock blasting, dust would settle on their houses. For years we have been breathing polluted air, and we are suffering from chest problems. This air is also not safe for our animals. Our houses have developed cracks due to the blasts, the community said. They also said the blasts also traumatised children and livestock. Thulebona Maphumulo said the company and the traditional council had failed to answer key questions. “They have failed to tell us how they are going to manage air pollution. 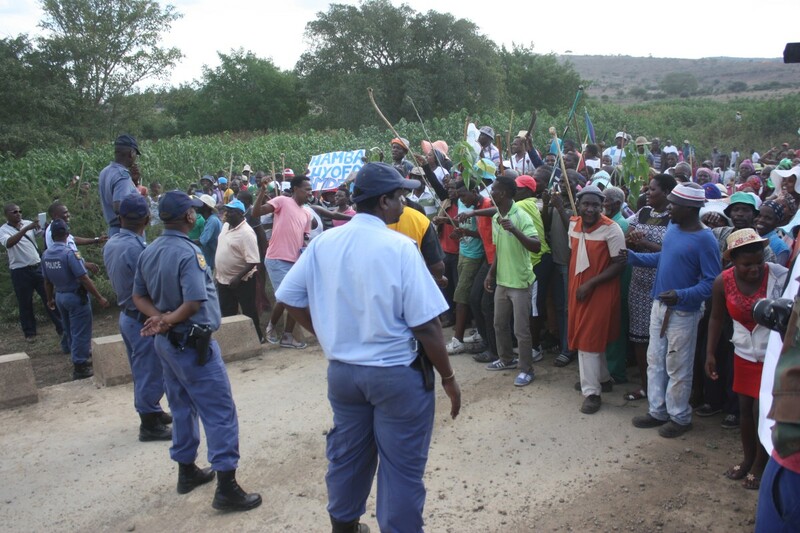 “They have failed to assure us that we are not going to lose our homes and grazing land,” said Maphumulo. The community appointed lawyers in 2011 to help them in their battle. “The lawyers have taught us lots about the effects of mining. We have watched videos about how mining has destroyed people’s lives,” he said. An adviser to Inkosi Temba Mthethwa, Bhekisisa Mthethwa, said the inkosi would not comment until the process was finalised to avoid taking sides. A Lawyer for the community, Kirsten Youens, said in terms of the law, not only the traditional council should support the mining. She said they would definitely take the matter to court if the Department of Mineral Resources gave permission for the company to mine. “The tribal authority is supposed to represent the people,” she said. NOTE: 16.000 people will be affected by the mine not 16,000 homes as reported in the article. Strength to these communities! And all hope that they keep their rights to their ancestral land, their clean air and unpolluted earth. Go away, Ibutho Coal. Traditional leaders, stop accepting bribes and represent your tribes, or your tribes will govern themselves without your corrupt leadership.